This above verse is probably one of the most important passages in the Bible! And probably one of the least obeyed! Because, isn’t it true that it’s so easy in this world, to let go of good habits? Yes, we make vows, and then we break vows! Maybe we fall off our New Year’s diet! Or we go back to smoking! Or we begin to have “just one glass” of wine again. Or we begin again to engage in gossiping! Or fall off our daily workout at the gym! Well, the list is seemingly endless regarding the things that we let slip away! And so it is also in the Christian’s daily warfare! Maybe we fall off our daily Bible study. Or we begin again to watch “just a little television”. Or we begin hanging out with the old crowd again. Or whatever other old habit we might be inclined to fall back into. This is perhaps, the greatest single danger to our Christian walk. This is the ultimate slippery slope that the Christian may inadvertently fall into! And when the Christian falls back into one old habit, you can just guess that the Devil has a few more old habits for that Christian to fall back into! 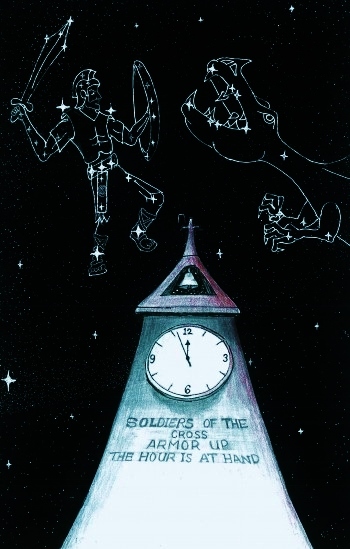 God has placed a marvelous set of constellations in the night-sky to illustrate just what is at stake in the Christians, “good fight of faith”. 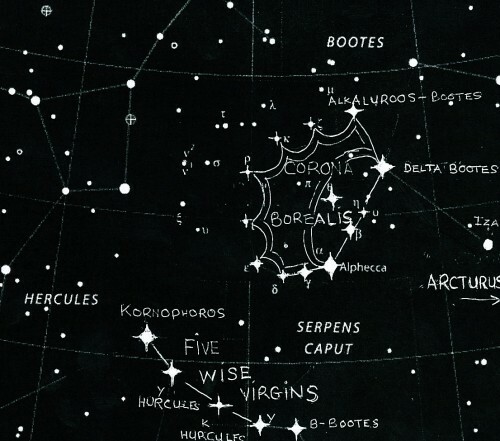 And right next to this constellation is the Revelation 12 Woman Constellation, which features a woman-with-child grasping for that Glorious Crown! Well there is much more to all these heavenly signs, which can be explored by going to the “Signs Of Heaven” website. Yes, this crown represents our Salvation. And even though we do not fully understand all the details of this crown, nevertheless, Revelation 3:11 is a fearful warning that the Christian should exercise great care that he or she does not take their Salvation for granted! The Christian must maintain vigilant watchfulness at all times! The eternal destiny is nothing to take casually. And so, as this above passage warns, the Christian must be watchful, vigilant, circumspect at all times! One amazing aspect to the Glorious Crown Constellation is that it is a rather dim constellation compared to most of the other constellations on this website. This no doubt is because God wants us to realize how little regarded that the Christian Crown is to most church-goers! Yes, we rarely think about the importance of winning this crown as we go about our day-by-day routines! This great truth shines very dimly in the minds of most of us, as we often get so overcharged with our mundane daily duties. And yet, the kingdom of Heaven and Heaven’s Jesus are the absolute most important aspect of our lives! And it would be better to be a homeless and poverty-stricken but a prayerful Bible student, than to be wealthy without the heart and mind fixed upon God’s Word and prayer! Three times in the 1st Chapter of 2nd Peter, he repeats the importance of not forgetting about these virtues, to have them in us and do them! Three times! So by God’s thrice repetition through Peter, it can be assumed that the Lord wants us to know how easily we can let these things slip away from us if we’re not careful! Well, the Good News is, that this is still the Day of Salvation! And there is no better day to turn away from our indifference and spiritual lethargy, and beg the Lord for repentance and heart revival! After all, we have everything to gain, and everything to lose in our Christian Race!